Smartphone, car, airplane, refrigerator, television, house and a various kinds of smart IT devices – these became a essential part of our life today. What if these are all connected on a network and a massive data exchange to each other immediately occurs through network, and all this process is carried by a AI(Artificial Intelligence) robot on behalf of us? To make this wonderful world, many competitors are struggling for innovative technology development such as IoT(Internet of Things), AI(Artificial Intelligence, VR(Virtual Reality), AR(Augmented Reality), Cloud and Big Data. They are leading technologies in 4th industrial revolution together with 5G Networks. This innovation was possible because of semiconductor and display technologies. They are essential hardware technologies for all kinds of industries and hardware and software technologies. Without them, the new world of 4th industrial revolution may be impossible. There are many global corporates manufacturing semiconductor and display such as Intel, Samsung, SK Hynix and LG. Although they are well-known, not many people know that huge and various equipments with application of fine and advanced technologies are required to produce semiconductor and display. TEL(Tokyo Electron Ltd.) is one of the leading manufacturing equipment companies in the world, based in Tokyo, Japan. In years of history, TEL has contributed to the growth of semiconductor market, and particularly we need to pay attention on TEL Korea’s chairman Mr. Kuriki currently participating in CES 2019 in Las Vegas, US. He put emphasis on excellent customer care. As a chairman of TEL Korea for many years, he has always tried to listen to the needs of customers such as Samsung, SK Hynix, and LG. In order to satisfy customer’s desire for new and innovative technologies, he consistently think and supply new services and his effort contributed not only to the growth of TEL Group’s business, but also to the Korean companies to lead the world’s semiconductor market. In addition to perfect customer care, Mr. Kuriki has led TEL Korea to solve a chronic problem of short lifespan of some main parts in semiconductor manufacturing equipment. He also increased training support to all engineers in TEL Korea so that some of the engineers in TEL Korea is sent to other countries for technical support which helps build a global technical network. By doing this, Mr. Kuriki helps Korea become the leading country in world semiconductor market. His effort to produce the best manufacturing equipments in Korea is continuing. 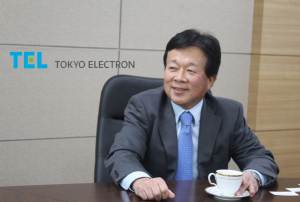 TEL Korea and Mr. Kuriki is a hidden leader in semiconductor and display market. Just like he 4th industrial revolution pursuing borderless world that all technologies and data connects through a network, Mr. Kuriki and TEL Korea is ready to build its own network to connect TEL group and all customers over the world for the excellent communication. Through this, we will experience smartphone, smart display and other types of new smart devices of the new world soon.